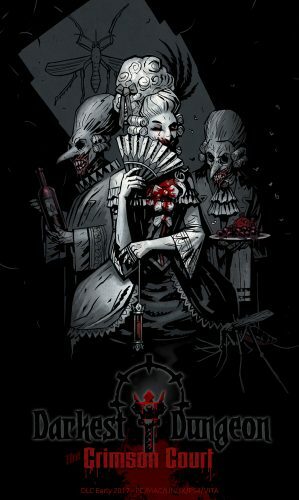 For those of you that are unaware of Darkest Dungeon, it is another one of those games that throws the word rogue-like into its description. A turn based RPG with a Lovecraftian feel that attempts to convey the true psychological stresses of adventuring. 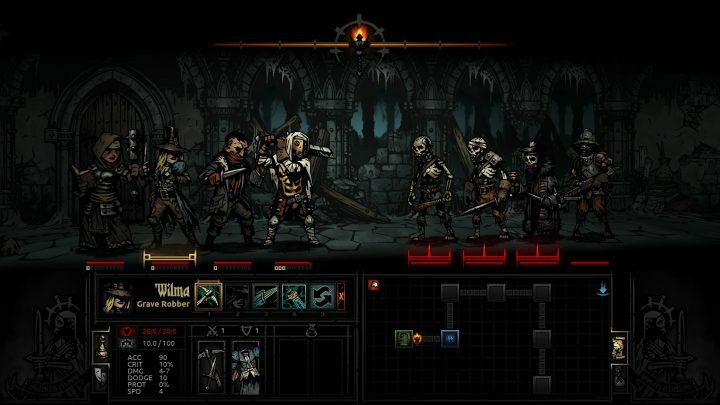 At first look, Darkest Dungeon seems to present its content in a fairly standard way. Recruit parties of adventurers and send them off in to the depths of your ancestor’s estate in search of gold, glory and adventure. Watch out for deadly traps and kill beastly enemies, all the while working your way towards frightening bosses and the truly horrifying Darkest Dungeon. Then you realise that not only are your adventurers fighting for the lives, they’re also fighting for their sanity. Do not expect your plucky heroes to return from their quests victorious and smiling. Chances are they are more likely to come back as broken men and women, psychologically tortured from the things they’ve seen. Something that you learn very quickly in Darkest Dungeon is that whilst it’s nice to see that your health bar is nearly full, it’s nowhere near the most important thing when it comes to survival. Every time your party takes damage, every time the torch burns down that little bit further, the stress of your adventurers increases. Perhaps somebody took a critical hit from a skeleton and now has a crippling fear of the undead. Perhaps the abomination in your party transformed into his animal state during battle, leaving his companions with a feeling of dread. Even something as simple as a bookcase could leave your adventurers reeling with stress after reading something that has unsettled them. Too much stress, and your adventurers will soon reach breaking point, which is when the fun really begins. Only one saving throw separates the virtuous from the afflicted, the difference between a hero becoming courageous, or paranoid (amongst other things). Then it gets worse, if your heroes are afflicted, the stress keeps building, and the way that they react to their surroundings, and each other, will begin to affect their companions, dragging them ever closer to becoming afflicted as well. Then, if you reach the second breaking point, well that’s when the heart attacks happen. They might not always kill one of your heroes, but if somebody has a heart attack when they are already at zero health and hovering at death’s door, then it most certainly will. Of course if one of your heroes dies, then everybody else becomes more stressed, and sometimes before you know it, all your heroes are dead and you are transported back to your hamlet empty handed (or, as in my case, with a broken laptop screen). Luckily, there are ways to combat stress, and if your heroes make it back to the hamlet then all manner of stress-relieving actives are available, although which are most effective, or indeed available, may be limited by the particular hero in question, and his or her perks. Perhaps you have a hero that will only relieve stress by visiting the brothel, or perhaps their sexual deviancy precludes them from such activity. Perhaps you only have one space available in the abbey, only to find that the caretaker is occupying it and it’s not available for this turn. On top of all this is the constant question of whether such investment is worth it. Darkest Dungeon is not a game where you should become attached to your heroes. Are they too broken to be of use? Did they have a heart attack brought on by stress? Or maybe they have too many negative quirks to be really useful. Sometimes it is better to just cut them loose and send them away. There is a never-ending supply of fresh-faced recruits unaware of the horrors they face to exploit, after all. 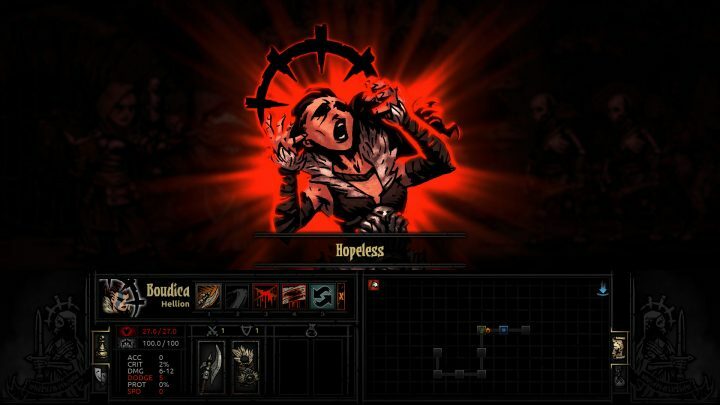 The greatest thing about Darkest Dungeon is that whilst strategy will help you, your own luck and the fickle mistress that is RNG might just be working against you. It’s a truly excellent game that can be played over and over, with each dungeon you enter being randomly generated and town events popping up between adventures that can be used to your advantage. On top of the game’s excellent gameplay, you can add in its gorgeous Lovecraftian artwork, and the phenomenal voice acting of Wayne June as the narrator, which all leads to a game that is truly deserving of your attention. Darkest Dungeon staked its claim as my game of last year following its early access and eventual release on January 19th, 2016, and firmly remains in place as one of my favourite games. I still play it on a regular basis, although I do try not to inflict bodily harm on my gaming rig when doing so. 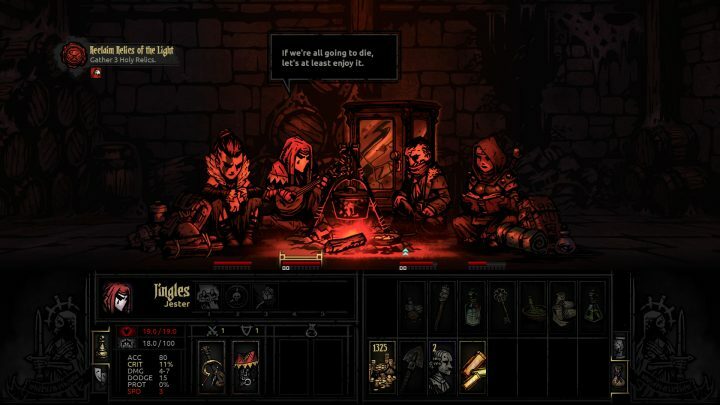 The final string in Darkest Dungeon‘s bow however is not just the game itself, but its creators, Red Hook Studios Inc. Having taken part in the early access the one thing that was very clear right from the start was that the game’s developers not only wanted feedback from their players, but they truly listened to it. Extremely active on social media they were always there to hear complaints, be advised about bugs and just generally interact with their players and answer their questions. A trait that remains in place. Now, with its first DLC, The Crimson Court, slated for release on 19th June 2017 at the low price of $9.99 (£7.85), there’s even more to be excited about. The new release adds an entire new area to the base game that comes with a new hero class, its own enemies and four unique bosses to fight, amongst other things. In fact, I would say there’s no better time to buy the base game, which is currently only £18.99 on Steam. And if all the above doesn’t convince you, “let me share with you the terrible wonders that I have come to know“. Check out the trailer below, which provides not only a look into the world of Darkest Dungeon, but also an example of that excellent voice acting I mentioned earlier. Welsh expat currently residing in Hertfordshire. Photographer, writer, tea lover and PC gamer. Powered by tea, hugs and chocolate since 1984. Nerd credentials always on show.